[AUTHOR'S NOTE: This is another of those rewrites I put off for as long as possible. When I wrote the original, with Mike Redmond, back in 1975, it seemed pretty cut and dried. I thought there was a single group, the "Cues," who also recorded as the "4 Students," the "Rhythmakers," the "Gliders," the "Ivorytones," the "Blues Kings," the "Playboys," and the "Boleros," and it was a kinda neat story. I realized that there were occasional shifts in personnel, but I really wasn't prepared for most of the sessions to have had different singers. A lot of the songs that Abel De Costa voiced backup for weren't with the Cues at all, but with a conglomeration of studio singers. But he was on so many sessions that there's no wonder he couldn't keep them all straight. Most of this is untraceable now. The files needed just aren't available; Abel De Costa and Ollie Jones are both deceased. Atlantic owned the rights to the names "Rhythmakers," "Gliders," etc. and used whatever singers were available, including members of the Cookies. For example, the first time the name "Rhythmakers" was used for the group backing up Ruth Brown, it wasn't the Cues at all, but the Drifters! In a similar vein, Groove owned the name "4 Students" and used whoever they wanted (in most cases the names of the "4 Students" weren't even recorded on available session sheets). Atlantic Records had plenty of groups: the Harlemaires, the 3 Riffs, the Delta Rhythm Boys, the Clovers, the Cardinals, the Diamonds, the Drifters. And, along with the groups, Atlantic had a lot of hit-making single artists: Ruth Brown, Lavern Baker, Joe Turner, Ray Charles, Ivory Joe Hunter, Clyde McPhatter, and Chuck Willis. In the past, record companies had paired single artists with groups. Notable were: Little Esther with the Robins and the Dominoes; Dinah Washington with the Ravens; Savannah Churchill with the 4 Tunes, the 5 Kings, and the Striders; Chuck Willis with the Royals; and of course Atlantic's own Ruth Brown, with the Delta Rhythm Boys. However, other than Savannah Churchill and the 4 Tunes, these were usually one-shot deals. To take the idea one step further, Jesse Stone, Atlantic pianist and arranger, conceived the idea of having a permanent, resident backup group for Atlantic's single artists. (Up until then it was a haphazard affair. For example, when they needed a "group" to do the chorus on Joe Turner's "Shake, Rattle and Roll," it was comprised of Stone, with Atlantic executives Ahmet Ertegun and Jerry Wexler!) 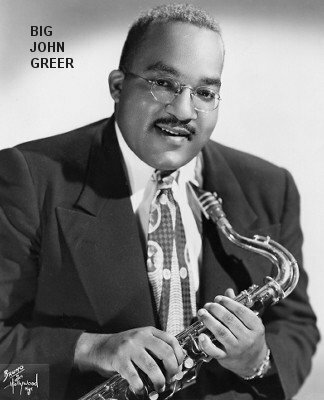 To implement his idea he contacted Henry Oliver "Ollie" Jones, well-known second tenor (the original tenor lead of the Ravens, who then went to the 4 Notes, and finally the Blenders). In 1954, he was dabbling with songwriting, since the Blenders were relatively inactive. Stone also asked baritone Winfield Scott to join. (While he used his real name as a songwriter, as a singer he was usually known as "Robie Kirk.") The other original members were a tenor named Dave and a bass named Frank (whose last names Ollie Jones didn't remember). The quartet was named the Cues. Stone brought the Cues to Atlantic to start backing up all those single artists. (Strangely, the Cues would never record for Atlantic under their own name.) Each artist had a "different" backup group: Ruth Brown (Rhythmakers), Lavern Baker (Gliders), Ivory Joe Hunter (Ivorytones), Joe Turner (Blues Kings), Charlie White (Playboys). Once, I would have said "Ha, ha, the laugh's on us; they were all the same group." Now, I can only say that several members of the Cues were involved with any given session. Atlantic not only doled out those names, they owned them. Before the Cues were even associated with the company, Atlantic had used the name "Rhythmakers" on the Ruth Brown session that produced "Oh What A Dream," "Somebody Touched Me," "Please Don't Freeze," and "Old Man River." This anonymous backup group was the Drifters! The Cues' first job was probably backing up Charlie White, as the "Playboys" ("Tell Me"/"Rock, Moan And Cry"), released in August 1954. Soon after this, they supposedly backed up Carmen Taylor, as the Boleros ("Freddie" and "Ooh I") in September. The reason I say "supposedly" is that, while "Ooh I" has a nondescript vocal group which could be the Cues, "Freddie" has one that interacts with Carmen. This is unusual (but not unheard of). Usually that signifies a good deal of practice, not just a thrown-together session. One of Stone's other tasks was running Aladdin's Lamp subsidiary (which was operated out of New York). While he didn't last too long there, his Cues had a single release on the label in October 1954: "Scoochie Scoochie," backed with "Forty 'Leven Dozen Ways." As was usual in the business, Lamp announced the signing of the Cues in October, while their only session had already been held on September 13. Two other acts that Stone worked with also ended up here: the Cookies (on Lamp) and the Regals (on the parent Aladdin label). By the time of their Lamp session, tenor Dave was gone, replaced by first tenor Abel De Costa (who had previously sung with Ollie in the Blenders). Abel is doing lead on "Forty 'Leven Dozen Ways," while Ollie leads "Scoochie Scoochie." 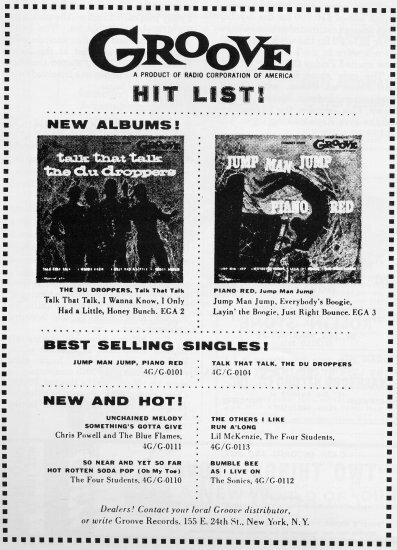 The Lamp record was reviewed on November 6, 1954 (both sides "good"). Other reviews that week were for Marvin & Johnny's "Sugar," the Royal Jokers' "Someday We'll Meet Again," the Gentlemen's "Tired Of You," Big John & the Buzzards' "Oop Shoop," the Charmers' "I Was Wrong," and the Singing Wanderers' "The Wrong Party Again." However, Lamp didn't do too well and Aladdin deactivated it until it could put someone else in charge. This meant that Stone was free to take his acts to Atlantic (although the Cues had already had been the "Playboys," and maybe the "Boleros"). On October 20, the Cues (as the "Gliders") backed up Lavern Baker on "Tweedle Dee" (written by Robie Kirk). However, by this time, the mysterious Frank had departed, to be replaced by bass Edward Barnes. In their role as back-up artists, the Cues were extremely successful. In many cases they were on both the original version of a song and on one or two cover versions. They completely transcended the controversy over cover records by appearing on the original R&B recording and the pop cover. A case in point is "Tweedle Dee": it was such a big hit that Mercury Records got Frieda Lipschitz to record it too. [Oops. Wait a minute. You probably know her better as "Georgia Gibbs."] Mercury was so impressed with Atlantic's handling of the tune that they got the Cues and most of the original musicians to provide Georgia's backup. Another facet of the Cues' work was to make demonstration records. They would record a new song in an independent recording studio. The song was then sent to record companies so that the A&R men could hear what the song sounded like and choose an artist to fit it. This turned out to be a financially successful sideline for them; not only were they paid for making the demo, but many times a record company would insist that the Cues back up whatever artist was chosen to do the tune (no credit, but possibly more money than the artist would make with the song). That disc was reviewed on June 4 (both sides "good"), along with Shirley & Lee's "Feel So Good," Arthur Lee Maye & Crowns' "Love Me Always," the 4 Fellows' "Soldier Boy," Marvin & Johnny's "Sugar Mama," the 5 Keys' "My Love," and the Cadets' "Rollin' Stone." Then, in June, there was a 4 Students record on RCA's Groove subsidiary. 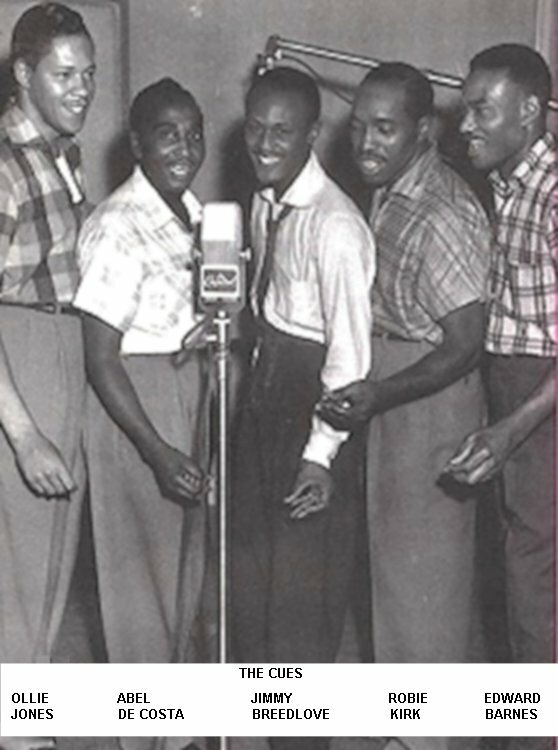 Ollie Jones, Abel De Costa, Robie Kirk, and Edward Barnes had recorded "So Near And Yet So Far"/"Hot Rotten Soda Pop (Oh My Toe)" on April 4 (presumably before Jimmy Breedlove had joined). Strangely, while they were billed as the 4 Students, there were five of them on the record. 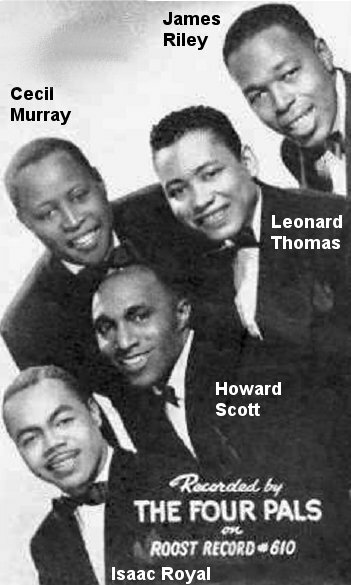 According to company files, the fifth singer was Curley Williams. Was this the same Curley Williams who would appear on Modern in late 1956? I have no idea. (My feeling is that it isn't the Country & Western singer who headed up the Georgia Peach Pickers.) While the "4 Students" would appear on many Groove releases, this was the only one on which they weren't a backup group. "So Near And Yet So Far" was given a "fair" rating on June 25, 1955. Other reviews that week: Nappy Brown's "Piddly Patter Patter," the Jaguars' "I Wanted You," the Tenderfoots' "Those Golden Bells," the Laurels' "Tis Night," and Wynonie Harris' "Git With The Grits." Another June release on Groove was "Run Along"/"The Others I Like." This time, the 4 Students (still without Jimmy Breedlove) were backing up Lil McKenzie. 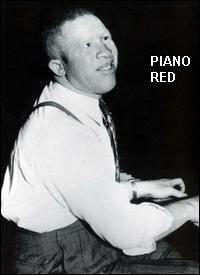 In August 1955, Groove released "Goodbye," by Piano Red and the 4 Students. Is this the Cues? I don't know; there's no indication in the RCA files. You'll see soon enough how complicated this can get. Also in August, the Cues secured a contract with Capitol records and held their first two sessions. On August 11, they recorded "Momma Loves Poppa," "Burn That Candle," and "Charlie Brown"; on August 24, they added "You're On My Mind," "Much Obliged," "Oh My Darlin'," and the first, unreleased, version of "Why". "Burn That Candle" (written by Robie Kirk and led by Jimmy Breedlove)/"Oh My Darlin'" (led by Ollie Jones) came out in September. "Burn That Candle" was immediately covered by Bill Haley & the Comets, who had a nice hit with it. "Burn That Candle" got a "good" rating on October 4, along with Clyde McPhatter & Ruth Brown's "Love Has Joined Us Together," the Spiders' "Witchcraft," the Midnighters' "Don't Change Your Pretty Ways," the 4 Fellows' "Angels Say," the Cats' "I Don't Care No More," the Sycamores' "I'll Be Waiting," Rosalle & Donnelle's "Beginning Of Our Love," and the Scarlets' "Kiss Me." 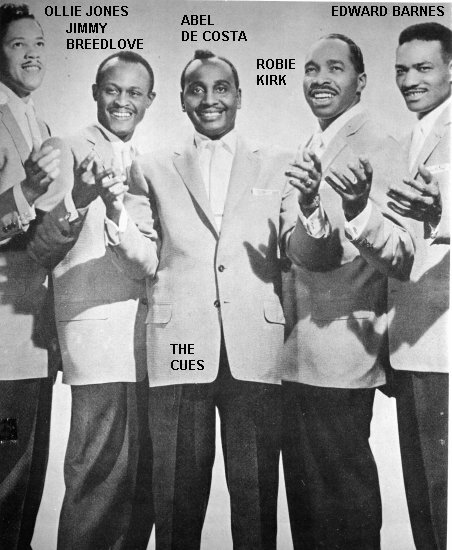 Within about a one-month period, they were the 4 Students (on Piano Red's "Goodbye" [maybe]), the Rhythmakers (on Ruth Brown's "What'd I Say"), the Gliders (on Lavern Baker's "Lucky Old Sun"), the Blues Kings (on Joe Turner's "The Chicken And The Hawk"), and the Cues (on "Burn That Candle"). These guys were workin'! Two more 4 Students records came out in November 1955. The first was Zilla Mays and the 4 Students, doing "Come Back To Me" (the flip had no group). However, just as Atlantic owned "Rhythmakers," "Gliders," etc., Groove owned the name "4 Students." Zilla is backed by Cecil Murray, James Riley, Howard Scott, and Leonard Thomas. While these aren't household names, they'd been around since 1947, having recorded as the Rhythm Masters (Bandwagon), the Rhythmasters (Bennett), and the Rhythm Kings (Ivory and Apollo). They'd lately been recording for Kay and Royal Roost as the 4 Pals (with the same ancient photo that they'd used since 1950, even though pianist Isaac Royal had been gone for years). The other November entry was the 4 Students backing Sue Allen on "Think Of Tomorrow" (the flip was a duet between Sue Allen and Oscar Black). Who were these "4 Students"? The company files are mum. Could be the Rhythm Kings again, or some combination of the Cues, or even a different batch of singers. There's simply no way to tell. The next Capitol Cues' release was December's: "Charlie Brown" (not the future Coasters' song), backed with "You're On My Mind." Both were led by Ollie Jones. Also in December, "A Man And A Woman" has Big John Greer backed up by the 4 Students (the flip was an instrumental). Once again, we have no way to tell which, if any, of the Cues were on this. 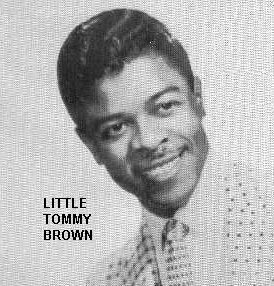 The third December entry was "The Thrill Is Gone"/"Gambler's Prayer," which had the 4 Students backing Little Tommy Brown. This group was the 4 Pals again. 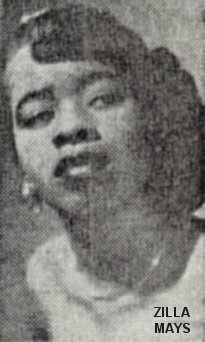 1956 began with Varetta Dillard's Groove cover of Ruth McFadden's "Darling Listen To The Words Of This Song." On this January 1956 side she was backed up by another anonymous 4 Students group. On February 24, the Cues did some more recording for Capitol: "Don't Make Believe," "Crazy Crazy Party," "Rock And Roll, Mr. Oriole," and Destination 2100 And 65" (the first, unissued version). They recorded three more songs on March 1: the second version of "Destination 2100 And 65," the second version of "Why," and "Be My Wife." In April, Capitol released another Cues record: "Destination 2100 And 65" (led by Ollie Jones), coupled with "Don't Make Believe" (fronted by Jimmy Breedlove). 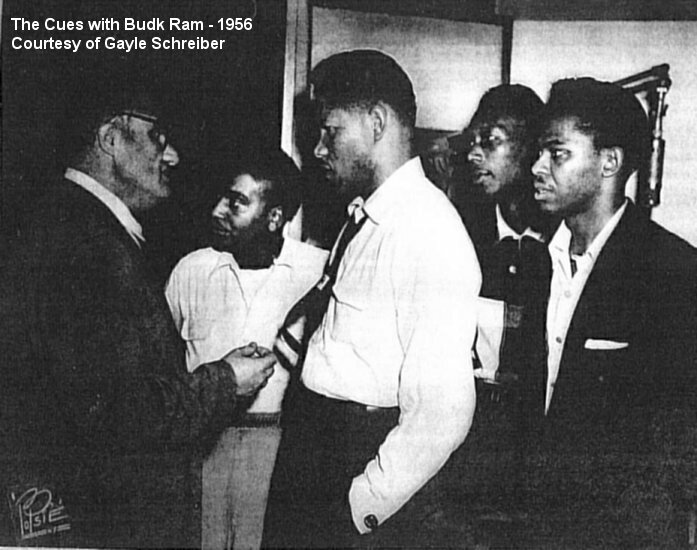 Also in April, the 4 Students backed Charles Calhoun (author of "Shake, Rattle And Roll") on "Jamboree." While the session sheet doesn't list personnel, since "Charles Calhoun" was a pseudonym of Jesse Stone, it's reasonable to assume that it's the Cues on this side (the flip has no group). And there was a third April release, this time by Varetta Dillard and the 4 Students. One side ("Cherry Blossom") came from the same session that produced "Darling Listen To The Words Of This Song," so the backup group is unknown. 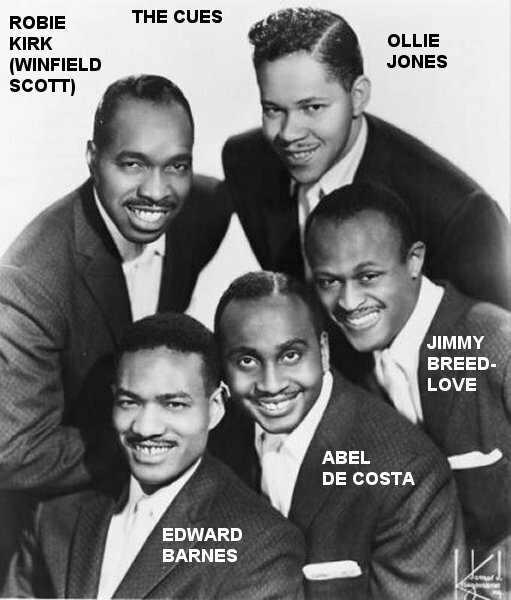 However, the flip ("I'm Gonna Tell My Daddy") had the singers listed as: Jimmy Breedlove, Abel De Costa, Ollie Jones, baritone Luther Dixon (of the Buddies on Glory; who seems to have replaced Robie Kirk), and bass Joseph Smalls (who took over from Edward Barnes). Close enough. This is, as far as I know, the last time the "4 Students" name was used. Maybe Groove was as confused as I am. However, there was one more bounce for the "ball of confusion." Another Groove release in April was credited to "Beverly Wright and the Students." Was "Shake Till I'm Shook" recorded with the Cues, the 4 Pals, or some other group altogether (the flip is a straight solo)? Did Groove accidentally leave the "Four" out of the name? Was it a real group called the Students? Once again, we have no answer. On May 29, the Cues held another Capitol session under their own name. The songs recorded were: "Crackerjack," "The Girl I Love," "Yes Sir," and "Killer Diller." In July 1956, Capital released the Cues' "Crackerjack" (led by Jimmy Breedlove)/"The Girl I Love" (fronted by Abel De Costa). That record was reviewed on July 21 (both sides "good"). Other reviews that week were for the Gassers' "Hum De Dum," the Tempters' "I'll See You Next Fall," the El Dorados' "A Fallen Tear," the Spaniels' "Since I Fell For You," the Hurricanes' "Dear Mother," the Phantoms' "The Old Willow Tree," and the 4 Dots' "Peace Of Mind." Also in July, the Cues took on Buck Ram as their manager. In August, the Cues were part of Ram's "Happy Beat For Happy Feet" tour (the only tour, or even appearance, I could find for the Cues [but they were extremely busy in various studios]). Its first stop was at the Casino Theater in Toronto, wending onward to Montreal, Chicago, and other (unlisted) venues. Others on the Ram-acts-only tour were the Flairs, Shirley Gunter, Dolly Cooper, Young Jessie, and Joe Houston's Orchestra. The Cues' last Capitol session was held on September 20, 1956. The songs were: "Warm Spot," "Ladder," "Prince Or Pauper" and "I Pretend." The Cues' next Capitol release was November's "Why" (led by Jimmy Breedlove), coupled with "Prince Or Pauper" (led by Ollie Jones). "Why" was one I remember Alan Freed playing during my [happily misspent] youth. It was reviewed ("excellent") on November 17, along with the G-Clefs' "Cause You're Mine," the Continentals' "Dear Lord," the Diablos' "A Teardrop From Heaven," the Baltineers' "Tears In My Eyes," the Cardells' "Helen," and Sam Price's "Rib Joint." The last record by the Cues was issued on Capitol's Prep subsidiary in May of 1957: "I Pretend" and "Crazy, Crazy Party." They were both led by Ollie Jones and had been recorded in September and February 1956, respectively. By the time it was released, Jimmy Breedlove had left the group (he'd had a single, "The Sky"/"Danny Boy", released on Capitol in January 1957). Strangely, despite the success of The Cues in providing back-up vocal harmony to some of the most prominent artists in the Rhythm & Blues and Pop fields, they couldn't produce a substantial hit on their own. 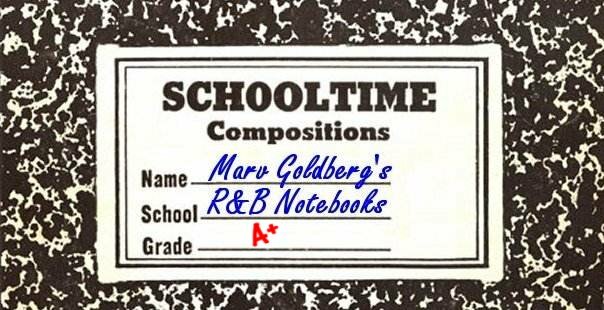 We can probably blame Capitol for that: they had no real idea what to do with an R&B act. Abel told me that the Cues also worked extensively for other record companies backing up Nat King Cole on "Looking Back," Jimmy Jones on "Handyman," and Roy Hamilton on "Don't Let Go." However, these were all from the late 50s, so, while I accept that Abel was part of the background group on these songs (possibly even putting together the roster of singers), I doubt it's the Cues. In rummaging through my old notes, I see that Abel listed the group on "Looking Back" as Abel De Costa, Ollie Jones, Jimmy Steward, and Noah Hopkins. Not exactly the Cues. Others whose sessions Abel was on included Vaughn Monroe, Cab Calloway, the Barry Sisters, Dorothy Collins, Josh White, Mahalia Jackson, Margie Day, Bobby Darin, J.P. Morgan, and Brook Benton. Somewhere along the way the Cues, as a cohesive group, ceased to exist. 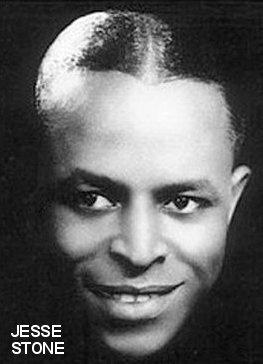 Ollie Jones was heavily into songwriting (he wrote Nat King Cole's "Send For Me," the Crests' "Step By Step," the 5 Keys' "Handy Andy," the Crescendos' "Oh Julie," and even Fabian's "Tiger"), as was Robie Kirk/Winfield Scott ("Burn That Candle," "Deep Sea Ball," "Gee Whittakers," "Hot Ziggity," "Hush-A-Bye," "One Broken Heart For Sale," "Thirty Days," and "Tweedle Dee. 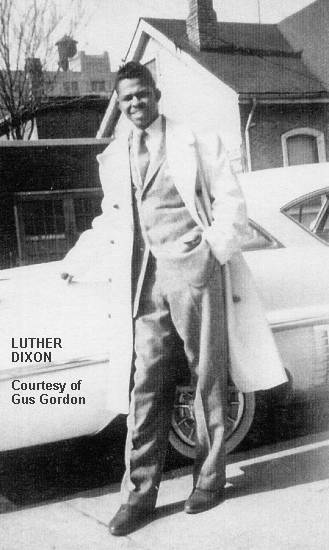 "), and Luther Dixon ("16 Candles," "Bad Man Of Missouri," "Don't Believe Him Donna," "Foolish Little Girl," "A Hundred Pounds Of Clay," "Human," "Soldier Boy," "Tonight's The Night," and "Traveling Stranger"). Eddie Barnes always seemed to have other gigs. Jimmy Breedlove pursued a solo career. Ollie Jones also sang with the Billy Williams Quartet around 1959. But there was still a demand for a group to lay down a background vocal track in the late 1950s. Therefore, Abel De Costa, continuing on in the Cues' tradition, wound up running an informal talent agency supplying top-rate singers for session work. In addition to employing former Cues members, when available, Abel would utilize Larry Harrison and Gregory Carroll (of the 4 Buddies); Jimmy Steward (of the Ravens); Joe Boatner (of various Ink Spots groups); and Noah Hopkins (bass on Clyde McPhatter's "A Lover's Question." He also used female voices, most notably: members of the Cookies, Theresa Merritt (star of TV's "That's My Mama"), Helen Way (whose Helen Way Singers were, along with Gregory Carroll, the "Orioles" on "First Of Summer"/"Come On Home"), and Doris Troy (whose "Just One Look" was a 1963 smash hit). In fact, most of the male singers Abel used could sing very high, so on some records it sounds like there are only girls. However, there came a day when the demand for background singers declined and the record companies had begun to depart New York, starting an exodus to Los Angeles, Memphis, and Detroit. Abel therefore joined an Ink Spots group, taking over the Deek Watson-type position (although, when he could, he continued to provide singers for background sessions). Abel was associated with one Ink Spots group or another right up until his death. The inner circle of elite vocalist/songwriters got together for an appropriate swan song: a 1961 MGM album, arranged by Bert Keyes, wherein each writer sang two songs (one established hit and one new tune), using the other writers as a backup group. Ollie Jones sang "Send For Me," Winfield Scott (Robie Kirk) sang "Tweedle Dee," Otis Blackwell sang "All Shook Up," Lincoln Chase sang "Jim Dandy," Billy Dawn Smith did "The Angels Listened In," and Eddie Cooley warbled "Fever." All in all, a fitting tribute to outstanding talent in the popular music field. Because of their unique role in the recording industry. The Cues probably participated in more hit records than any other group. As a representative sample, on Atlantic alone they were on: Lavern Baker's "Tweedle Dee" and "Jim Dandy" (but not "Jim Dandy Got Married" - that was the Coasters), Joe Turner's "Flip, Flop And Fly," "The Chicken And The Hawk," and "Corinne Corinna" (with the Cookies), Clyde McPhatter's "Rock And Cry," and Ivory Joe Hunter's "Since I Met You Baby." NOTE: The above two credit the "Rhythm Kings," but the backing "group" wasn't the Cues - see the text.